Many patients suffer adverse effects from radiation therapy. These side effects may be acute, occurring during or within a few weeks after therapy, or intermediate to late, occurring months to years after therapy. This risk is higher in younger patients in part because they have longer life expectancy for developing late effects. Medesis Pharma is developing a new drug to protect healthy tissues from the damaging effects of radiotherapy when used in particular for primary or metastatic brain tumors. In addition, patients cured of their primary malignancies may be susceptible to the development of secondary malignancies several years to decades after treatment. Increasing incidence of brain tumor (glioblastoma, meningioma) is one of the leading factors driving the growth of the market globally. For instance, the American Society of Clinical Oncology (ASCO) has reported that the brain tumor incidence rate is growing of 2.6% as compared to the last year. An estimated 22,850 cases have been diagnosed with primary cancerous tumors of the brain in the U.S. Additionally, about 30% of cancer survivors will develop secondary brain metastases. In fact over 200,000 patients/year in the US with malignant brain tumors, including primary and metastatic tumors, are treated with curative or palliative radiation therapy. Over 100,000 of these long-term survivors (>6 months) will develop brain injury that affects their quality of life. In the brain, as in other tumor sites, radiation dose prescriptions and probability of tumor control are constrained by normal tissue tolerance, despite the use of state-of-the-art radiation delivery techniques and improved modeling of dose distributions. 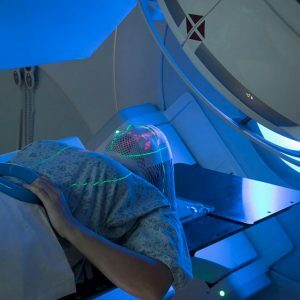 New stereotactic radiotherapy techniques that use high doses per treatment session may provide benefit in the treatment of metastases, but their impact on treatment of glioblastoma may be mitigated by tumor extension beyond what is detectable by imaging. Radiation injury to brain develops months to years after therapy, and is severe and irreversible. In the past, delayed radiation injury was thought to be solely due to a reduction in surviving clonogens of parenchymal or vascular target cell populations; this hypothesis now appears to be simplistic. Radiation injury is dynamic and involves not only loss of parenchymal and stromal cells, including vascular cells, but also impaired proliferation of precursor cells. Reactive oxygen species (ROS) and waves of pro-inflammatory cytokines also lead to tissue damage and functional deficits. To date, no drugs have been approved as radiation injury mitigators, which are defined as agents administered after irradiation but before toxicity is manifest. Medesis has an active product as mitigator to protect patients from radiation as demonstrated in preclinical studies.